In June of this year, I posted a link to Twello.com. This is an on-line directory that enables one to search by location, people on Twitter who have a following. According to Twello, in June 25 people with a Katonah location had a following. In five months, that number has more than double to 60.
something and can acquire a following, Twitter could become an income stream for you. There appears to be a need for maintaining all parking meters in working order for the Katonah commuters as some commuters may be receiving unwarranted parking tickets as a result of faulty parking meters not accepting cash and the commuter in a rush to catch a train. This commuter posted this complaint on her blog on November 12th and would like to get her ticket dismissed. I commute to New York three times a week, parking in the metered section of the lot around the corner from the Katonah station. As I hope you know, one of the machines there doesn’t accept cash, leading to a line of ill-tempered and borderline volatile commuters every morning in front of the one machine that works. This strikes me as outrageous. Surely it should not be the case that it is easier and more efficient to park in the remotest regions of Romania than here, in Westchester County! The metered spots are great, a veritable godsend for those of us who commute on an as need basis, but their maintenance desires closer attention. Michael Herrick of Southbury, Connecticut submitted on November 15, 2009 a detail page of the Katonah Civil War Memorial to the Historical Marker Data Base(hmdb.org) listing men from Katonah, NY who served during The Civil War of 1861 – 1865. In addition there are links to other historical markers that are within 9 miles of Katonah. 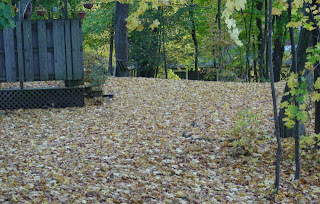 Here is the link to the 2009 Leaf Pickup Schedule for The Town of Bedford.